I was really proud of this set design. Since I can't ever do anything simple, the play I wrote (based on a fiction book of Copernicus' life) ended up having about 20 scenes. 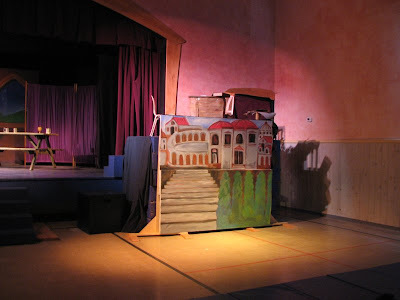 This meant that we needed a set that required very little moving of scenery but still allowed for several locations. The pictures below have all of the screens and curtains open or removed to allow all of the sets to be seen at once. 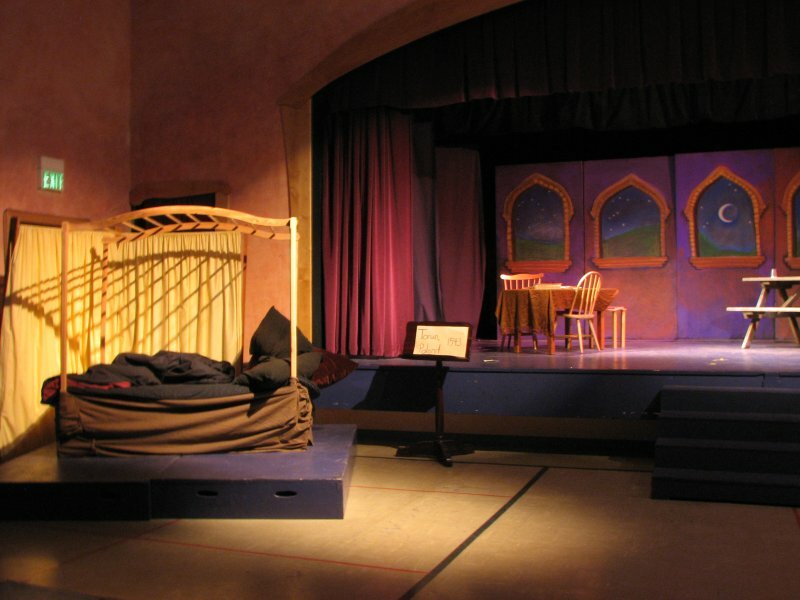 Many shorter scenes took place in front of the curtain with only a few props. All the lights are also up; different lights also helped differentiate the space. Our art teacher (and parent in the class) was amazing in leading them through the preliminary painting and chalk drawing of the sets and then finished them with her own masterful touch. The bed was used for his boyhood bedroom (which he snuck out of) and his final deathbed scenes. The "office" on stage right was several different offices at different time periods. The picnic table at the far right was a tavern scene. There were screens that got moved to cover the office or the tavern, depending on which set was needed. The Rome backdrop had a black sheet that flipped down over it when it wasn't in use and the "tower" above was used for several scenes.